To qualify, participating shops will hold a 1-day tournament or mega-battle or campaign for 10+ players for one (or more) Battlefront games. Stores can choose from Flames of War 4th Edition, Team Yankee, Viet Nam, Arab Israeli or Great War. Participant list (actual names of participants) must be submitted to Battlefront. Winners of participation prizes will be drawn and posted on Battlefront Miniature’s social media on Monday 12/4/2018 via live-stream. • Submit player list to Battlefront by 12/03/2018. 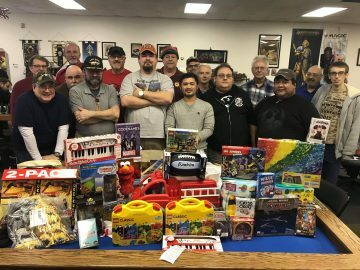 Include number of toys collected along with pictures of toy pile. • Submit tournament results to Battle Rankings by 12/3/2018 (if you ran a tournament; ignore if you ran a mega-battle or campaign). Entry Fee – Players provide a new toy (value $15 or more), store will take to their local Toys for Tots™ drop off point or local children’s charity after the tournament. For each additional toy beyond the first, participants get a token for 1 in-game reroll. Drawings for the winners will take place via live stream on our Facebook page sometime after the event. Store Benefits –Besides giving back to your local community, Battlefront will list all qualifying participating shops on its social media and on its home page. If the grand prize winner is drawn from your shop, you will receive a $300 credit to your account. If one of the army winners is drawn from your shop, you will receive a $100 credit to your account. And the shop with the most toys collected will receive a $250 credit! Rules and Restrictions: *Employees of the Battlefront and other companies / agencies / organizations associated with the promotion of the Contest, and their respective parents, subsidiaries, affiliates and advertising and promotion agencies as well as the immediate family (spouse, parents, siblings, and children) and household members of each such employee are not eligible. The Contest is subject to federal, state, and local laws and regulations. *Event organizers who are not paid store employees/owners are eligible to win prizes as long as they donate a toy(s). It is up to each individual shop to promote the event(s) in their shop. Feel free to coordinate activities with other shops in the area. 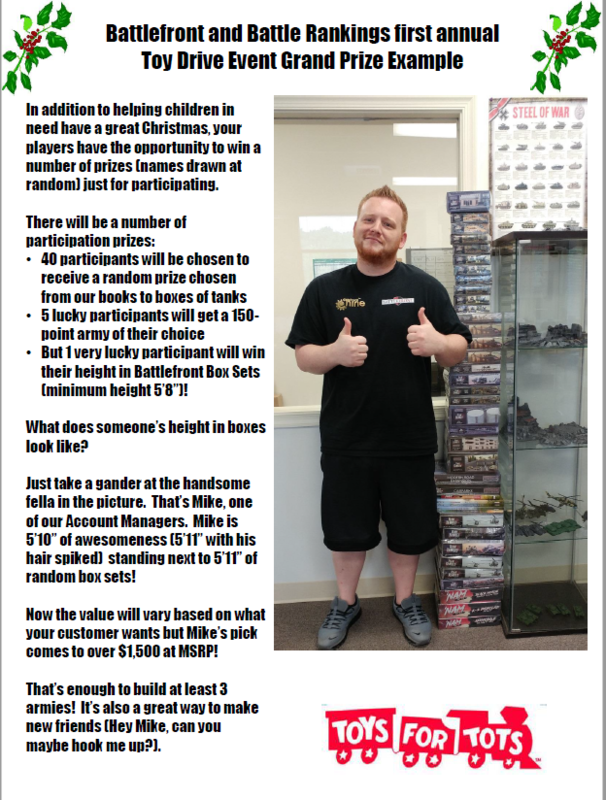 Maybe your shop is keen to do a Team Yankee event but one down the road is better at Flames of War –trade customers for a day, it’s for less fortunate kids after all!